Muse are to headline Reading & Leeds in 2017. The British rock titans - comprised of Matt Bellamy, Chris Wolstenholme and Dominic Howard - will return top the bill at the legendary music festivals, which take place between August 25 and August 27, for the first time since 2011. The 'Uprising' hitmakers have teased that they will share more about their "plans" for next year soon, which could mean they expand on their rumoured idea to levitate off magnetics on stage. Of their headline status, they said: "We're very excited to be playing Reading and Leeds again. More news about our plans for 2017 coming in the new year." 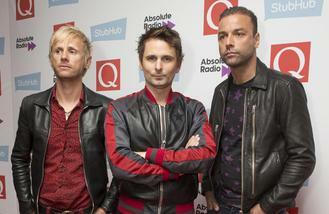 Organiser Melvin Benn commented: "I'm thrilled to be able to announce Muse as the first headliner for Reading and Leeds 2017. Their incredible live show promises to be an unforgettable performance - we have so much more to announce and I can't wait to reveal the rest of the line up." Elsewhere, 'Cold Water' hitmakers Major Lazer - comprised of Diplo, Walshy Fire and Jillionaire - and metal champions Architects will perform their only UK festival date at Reading and Leeds. Bastille, Against The Current, Andy C, At The Drive-In, Danny Brown, Glass Animals, Tory Lanez and While She Sleeps are also set to perform. Tickets for the festival are on sale now and available from the Reading and Leeds website. Duran Duran have lost a High Court battle to reclaim the US rights to some of their most well-known hits. Lady Gaga hopes she can use her "voice in the world" to trigger positive change. Izzy Bizu has been announced as the winner of the BBC Music Introducing Artist of the Year Award. Dua Lipa, Anne-Marie and Rag 'n' Bone Man have been shortlisted for the BRITs 2017 Critics' Choice Award. The 2017 BRIT Awards trophy has been unveiled. Meat Loaf hates performing 'I'd Do Anything for Love (But I Won't Do That)' live. Katy Perry has learnt a lot from her relationship with Orlando Bloom. Kate Moss is to star in an Elvis Presley music video.